Bans on Texting While Driving Don't Work: No Surprise! By now you're well aware that driving while talking on a cell phone is dangerous, and that driving while texting is a recipe for disaster. But now there's fresh government data to, well, drive the point home. According to the National Highway Traffic Safety Administration, "distracted driving," where the driver's attention is focused on an activity other than the road ahead, is a growing problem. 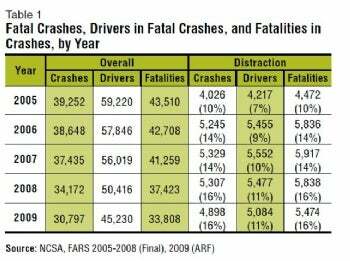 In fact, the proportion of fatalities linked to distracted drivers rose from 10 percent in 2005 to 16 percent in 2009. While the overall number of U.S. traffic deaths is on the wane--from 43,510 in 2005 to 33,808 in 2009--the percentage of fatalities associated with driver distraction is on the rise. Nearly one in five (18 percent) of all fatal distracted-driving crashes last year reportedly involved cell phones as the distraction, according to a new NHTSA study. In those crashes, the phone was either in use at the time of the crash, or was "in the presence of the driver" when the accident occurred. While mobile-device usage by drivers is a growing problem, distracted driving-related fatalities are often caused by variety of blunders, including eating, talking to passengers, and simply not watching the road. You might assume that teenage drivers are responsible for most cell phone-related fatal crashes--but you'd be wrong. While the under-20 age group did have the greatest proportion of distracted drivers in fatal crashes last year, 30- to 39-year-old drivers were most distracted by cell phones, the NHTSA says. So why are thirtysomething drivers most distracted by phones? One theory: They're a relatively affluent group and hence more likely to own the latest smartphones with all the bells and whistles (e.g., HD video, easy access to social networks like Facebook and Twitter). Makes you wonder if the connected car is really such a great idea. Contact Jeff Bertolucci via Twitter (@jbertolucci ) or at jbertolucci.blogspot.com .